It's FINALLY that time of year when we can actually start talking about S/S'14 fashion without sounding like a total A/W'13 party pooper...yay! On the 5th March, a handful of local Fashion Bloggers (plus Khyati and I obvs!) were invited to the Merry Hill S/S'14 Trend Preview event- an evening of sartorial inspiration for the upcoming season, showcasing both the key Westfield trends and a small selection of retailers from the mall to get us really excited about Merry Hill fashion. 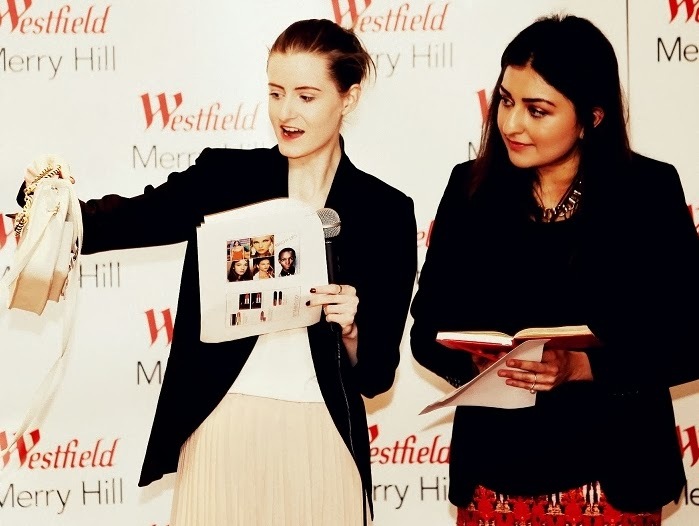 Although instead of plainly attending and covering the event for the blog, this time Khyati and I were asked to do a short presentation about accessorizing Westfield's key trends. Neither of particularly love public speaking but as we were presenting on a topic we're both really passionate about, it was actually a really enjoyable experience- despite a few pre-show nerves! Alongside a print out full of street style/beauty images to inspire our audience of bloggers, we also brought along a few examples of accessories available to buy at Merry Hill which we passed around the audience- a bit like fashion show-and-tell. For a first foray into fashion presenting, I reckon we did pretty well and had some really nice compliments from the bloggers which was really reassuring! We'll be uploading the images from the print-out to the blog very soon so all our readers have access to our accessorizing tips too, so keep your peepers out for that over the next couple of days. The rest of the evening's proceedings were hosted by the lovely Emma Russel from Stylissmo (@stylissmouk) who blinded us with her knowledge of the S/S'14 trends whilst showcasing some fantastic outfits, all of which featuring pieces from the top retailers at Merry Hill. This lady really knows her stuff so you won't be surprised to find out that she also offers an Image Consultancy service with lots of different packages- all details available here. After a quick break-down of each outfit, including handy tips about styling to suit your body shape, we were then treated to a mini-catwalk to see each outfit in motion. We must add that all of the outfits were modeled by real life (and very brave) shop assistants- it must have been pretty nerve wracking so well done ladies, you all looked fab and really worked the outfits! So here are the outfits, categorized by trend with full details on price and retailers. Get ready to be inspired! And remember- you can get your Spring Fashion Fix early as all these pieces are available at Merry Hill RIGHT NOW. LOOK 3 (DIFFUSION): Ames knitted dress with dipped back (£60), Versace Bag (£140) and Melissa Incense Wing Heels (£90). LOOK 1 (RIVER ISLAND): Asymmetric Top (£30), Cigarette Trousers (£30) and Black&White Peep Toe Heels (£65). LOOK 3 (VERO MODA): Aztec Print Trousers (£20), Tarina White Blazer (£38), Black Cami (£12,) Sako Necklace (£20) and Grab Through Clutch (£30). LOOK THREE (TWENTY9): Ted Baker dress (£189) and clutch bag (£99). LOOK 3 (GAP): Shirt Dress (£39.95), Belt (£16.95), Jumper (£24.95), Structured Oxford Shoes (£44.95) and Blue Day Bag (£34.95). 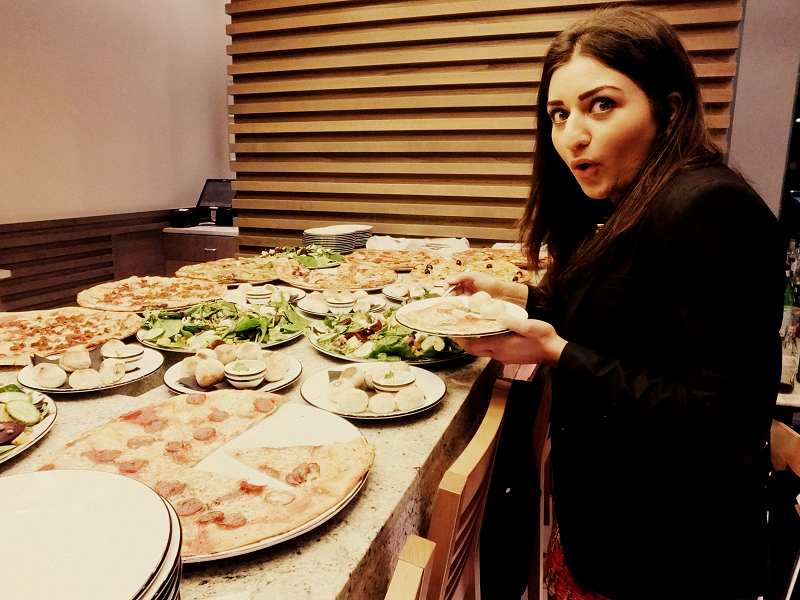 Khyati's face says it all...PIZZA EXPRESS BUFFET!!!111! 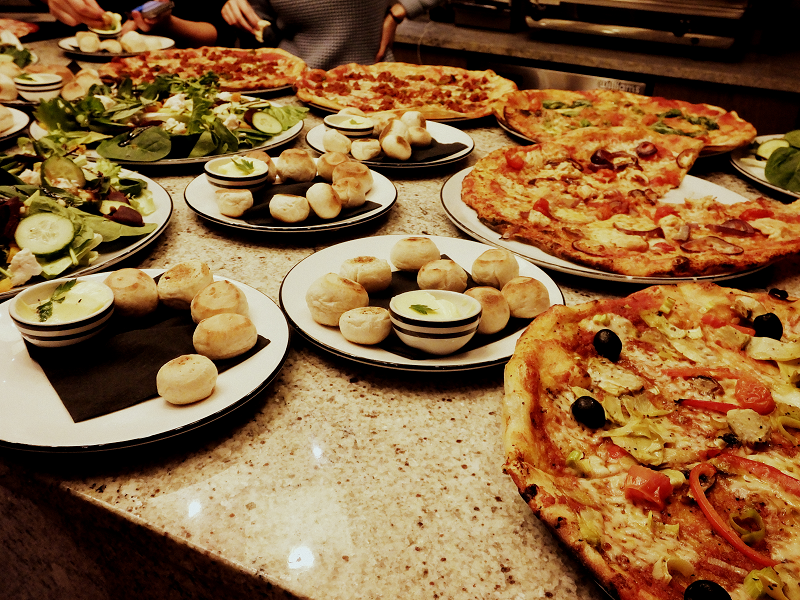 Seriously you'll never ever starve at a Merry Hill fashion event. And I can honestly say that there was not a crumb left after the models and bloggers had swarmed the table! All this fashion stuff is hungry business y'know. 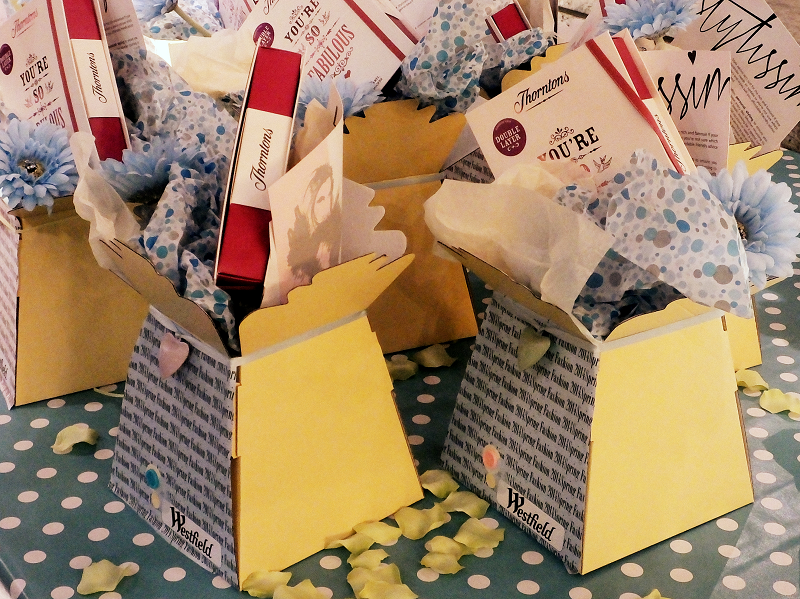 And if a pizza buffet wasn't enough we also received some super Spring inspired goody boxes which featured a box of tasty Thornton chocolates, a small selection of Body Shop body butter samples and most importantly our discount voucher booklets for the S/S'14 Fashion Weekend (15th-16th March). But more about that in a separate post very soon! 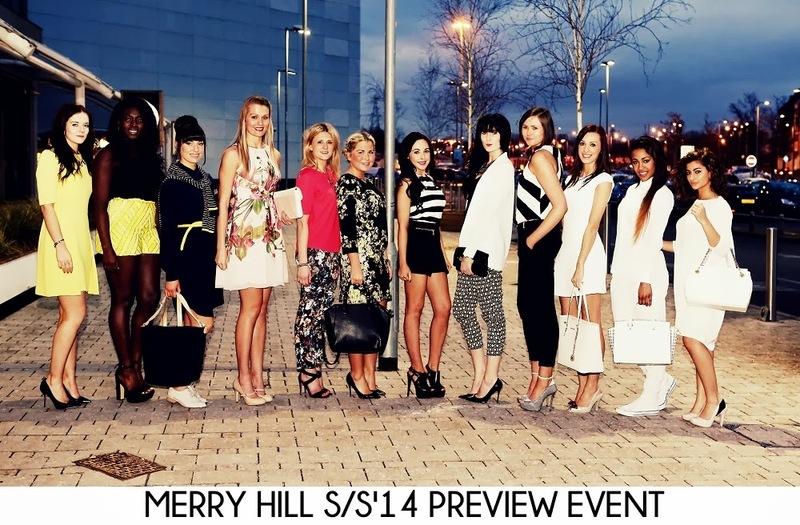 So that was the Merry Hill S/S'14 Trend Preview Event...hope you enjoyed the exclusive behind the scenes view of our evening. There will be lots more to come about S/S'14 at Merry Hill too- so get learning about the key trends readers! Was great to meet you both and your presentation was fab! I love the yellows and the florals. The floral print on the Ted Baker dress is beautiful and the warm yellow colours of the Embellished River Island shorts and the River Island shift dress are fabulous. There's something about yellow that helps cheer me up. I also love pink and couldn't help but notice the Warehouse pink neoprene tee. From the monochrome trend outfits the River Island Skort looks cute. That pizza looks scrumptious! What a wonderful event! It must have been wonderful to be in attendance there!